Back in the day when the AFC Central was one of the premier divisions this was a fierce rivalry. The two teams have faced each other 20 times in their history going back to the Titans former identity as the Houston Oilers. The teams are split at 10 wins a piece but the Ravens own the edge 2-1 in the playoffs. The last time the two teams faced each other was on September 18, 2011 with the Titans winning 26-13. The Ravens own the better record but their secondary is in disarray right now. The season ending injury to lockdown corner Jimmy Smith hurts as does regression and injury by other players. They recently retooled their secondary and released Dominique Franks and Chykie Brown. They brought Tramain Jacobs up from the practice squad and signed Danny Gorrer. This could be a prime opportunity for the Titans much maligned wide receiver group to step up and do some damage. The Titans are currently ranked 24th in the league in passing yards and their leading receiver is tight end Delanie Walker. Walker is averaging 59.4 receiving yards per game. That puts him ranked 35th in the league in average receiving yards per game. By contrast, four wide receivers are averaging over 100+ receiving yards per game. They are Demaryius Thomas (111.8), Antonio Brown (110.7), T.Y. Hilton (104.1), and Golden Tate (100.0). The Ravens are giving up 263.2 passing yards per game but let’s not forget they gave up 340 passing yards to Ben Roethlisberger in their last game which was a 23-43 loss in Pittsburgh. They did beat the Steelers at home in Week 2 and have only lost once at home this season. Meanwhile, the Titans are 1-4 this season having won their season opener at Kansas City. Their only other win was a 16-14 win over the Jacksonville Jaguars in Week 6. Frankly they were lucky to win that game. The Titans are 2-6 on the season. The Titans have turned to 6th round rookie Zach Mettenberger who made his first start before the bye week against the Texans. The performance was mixed but Mettenberger does have a big arm if they will let him use it. He also has pretty good pocket presence and will need it against a very stout Ravens front line. The strength of the Ravens might very well be their offensive line. The Ravens are ranked 9th in the league in rushing yards averaging 121.1 yards per game. This despite the Ray Rice drama and going with a combination of Justin Forsett, Bernard Pierce, and Lorenzo Taliaferro. The Ravens have 9 rushing touchdowns on the year. By contrast, the Titans have only 4 rushing touchdowns on the year and one of those was by Jake Locker. The Titans offensive line is performing poorly no doubt but the Titans simply are not running the football. The Titans leading rusher is Bishop Sankey who is averaging 9.4 touches per game. The Titans poor run game will face a Ravens team ranked 6th in the league and giving up only 86.4 yards per game. The old maxim would say to be successful in the NFL you have to stop the run and run the ball. The Titans have been successful at neither. The Titans run defense is giving up on average 134.8 yards per game and is ranked 29th in the league. If the Ravens secondary is a mess the Titans isn’t much better. The numbers just look a bit better because teams are choosing to run the ball, at will, against the Titans. They will face a formidable Smith brothers combination in Steve Smith and Torrey Smith. The Titans are coming off a bye and should be rested plus they get Coty Sensabaugh back which should help their secondary. Unfortunately, the Titans have lost two of their starting tight ends in Craig Stevens and Taylor Thompson. 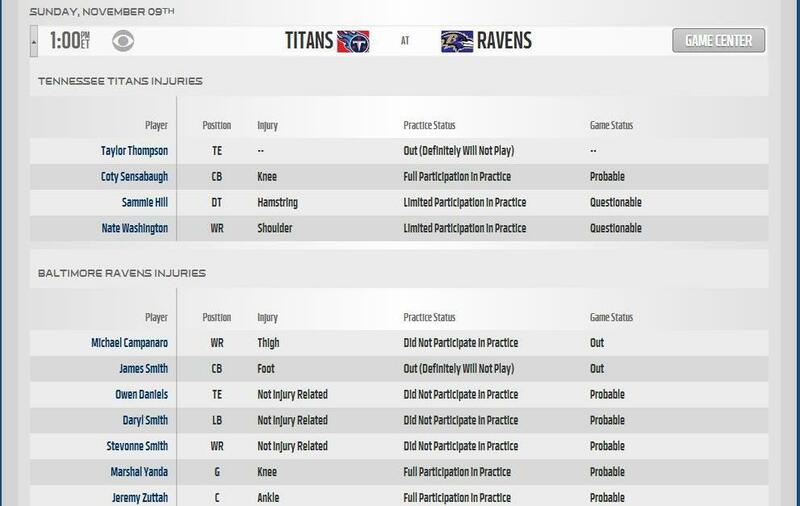 Sammie Lee Hill and Nate Washington are questionable. The key to this game for the Titans seems rather simple. Protect your rookie quarterback and throw the ball to set up the run. The Ravens are likely to stack the box and dare the Titans to throw it. They should. Their wide receivers need to step up and make plays. The offensive line can’t continue to commit penalties on first down and put the Titans in first and long situations. Clearly they aren’t good enough to overcome it. In the end, this game could come down to coaching and intangibles. The Titans need to play mistake free football and take advantage of a struggling Ravens secondary. Ken Whisenhunt has come under fire from some over his first year coaching performance and he could certainly silence his critics with a good performance in Baltimore. Vegas has the Titans losing by at least 10. Andrew Catalon, Steve Beuerlein, and Steve Tasker will once again handle the broadcast. This is their 4th time calling the game this year. Walt Coleman and his crew will officiate the game. The game time temperature is expected to be around 50 degrees and partly cloudy.